The earth, nesting in its solar system, is connected with the Milky Way and the twelve constellations. The impact of the stars as an influence on human behaviour has been known for millennia. In the original edition of Rudolf Steiner’s Calendar of the Soul, twelve illustrations of the constellations, made by Imma von Eckardstein, were published for the first time. These intuitive drawings differ greatly from the traditional ones, but Steiner stressed their importance for our modern consciousness. The images invite us to comprehend formative forces in their various guises in the kingdoms of nature. 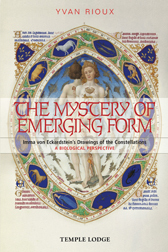 By exploring the gifts of each constellation, the author uses Imma’s drawings as a template to elucidate the emergence of twelve basic forms as the common denominators of all creatures, leading eventually towards the human form. YVAN RIOUX was already a keen naturalist as a boy, taught by Christian Brothers and Franciscans. He studied biology at Montreal University, but it left him cold as it didn’t touch anything that was alive. Working for ten years as a biodynamic farmer in Quebec, however, he encountered living ecosystems. Later, in Montreal, he taught on the relationship between human physiology and nature. In 1992 he moved to England with his two boys and joined a family of two girls and their mother, Gabriel Millar, who became his muse. Retiring ten years ago, he decided to write about his knowledge gained from 25 years’ of teaching experience, culminating in the publication of The Mystery of Emerging Form.